I think that saying must be about as old as the Ford Mustang. 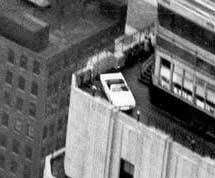 It turns out that 50 years ago when they introduced it to the public, looking for a publicity stunt Ford put a Mustang convertible on the observation deck of the Empire State Building, really! Now they are going to recreate the same buzz and this time with all the social media, it should get a lot of impressions. One was me today when I saw this story in AutoWeek. Amazing. Can’t wait to see how they get it back down. Wacky stunt!